Florence Clara “Busha” Petrick, age 97, of the Town of Buena Vista, died Wednesday, Feb. 6, 2019, at the Point Manor in Stevens Point. She was born Feb. 18, 1921, in the Town of Belmont. She is the daughter of the late Chester and Charlotte (Antkowiak) Warzynski. Her marriage to Joseph “Charlie” Petrick took place on May 8, 1943, in Chicago. He died on May 7, 1991. Florence owned and operated the Moore Barn Tavern in the Town of Buena Vista for 41 years. 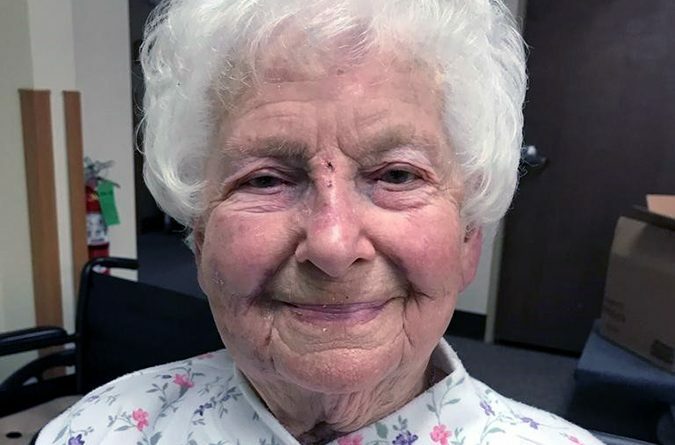 She enjoyed traveling, gambling, making pies, polka music, and dancing, jewelry and blanket making, spending time with family—especially her grandchildren who always made her smile. In lieu of flowers, a memorial in her name will be established at a later date. Survivors include three daughters, Delores (Vicki Turner) Petrick of Weyauwega, Denise (Mike) Modrzewski-Griswold of Plover and Donna (Joe) Dernbach of Almond; one son: Robert (Bonnie) Petrick of Wisconsin Rapids; multiple loving grandchildren, great-grandchildren, and great-great-grandchildren; one sister, Adele (Robert) Korleski of Almond; one brother, Raymond (Rosemary) Warzynski of Almond; and her two best friends, Anna Maday & Linda Kenowski. She is preceded in death by one granddaughter, Lori Ann Zinda; six sisters; and eight brothers. Funeral Mass will be at 10:30 a.m. on Monday, Feb. 11, 2019, at St. Bronislava Catholic Church, 3200 Plover Rd., Plover. Rev. Ed Shuttleworth will officiate. Burial will take place in the Hope Cemetery in Almond. Visitation will be from 3-7 p.m. concluding with a rosary prayed on Sunday, Feb. 10, 2019, at the Pisarski Community Funeral Home, 2911 Plover Rd. in Plover, and from 9:00 a.m. until the time of services Monday morning at the church. The Pisarski Community Funeral Home is Honored to be serving the Petrick family. For online condolences please visit www.pisarskifuneralhome.com.